Mandrill is a powerful delivery service that allows you to send one-to-one e-commerce emails and automated transactional emails. In this article, you'll learn how to add Mandrill to your account, or remove Mandrill if you decide you no longer need it. The Mandrill billing model is based on a monthly billing cycle, so Forever Free and Pay As You Go Plans can't use Mandrill. To use Mandrill as a paid add-on, upgrade to a Monthly Plan. Users on Monthly Plans with Mailchimp Pro get two free blocks of emails each month. You can upgrade to the paid version of Mandrill at any time. If you aren't currently on a Mailchimp Monthly Plan, you'll first need to upgrade or switch to a Monthly Plan. You'll be charged immediately when you upgrade, but we'll send your emails with the remaining trial credits before we use any purchased email blocks. 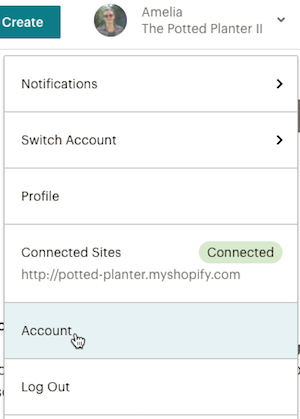 To add Mandrill to your Mailchimp account, follow these steps. Click Purchase Monthly Transactional Email Plan. Type the number of transactional email blocks you want in the blocks field. Blocks expire at the end of each monthly billing cycle. Set your preferences for when you run low on credits, and click Add. In the sidebar, click Complete Purchase. Mandrill credits renew every month, at the start of your billing cycle. If you run out before your next billing cycle, you can purchase extra credit blocks to meet your need at any time. Additional blocks you purchase still expire at the end of your monthly billing cycle, so we recommend you only purchase blocks you plan to use. To purchase additional Mandrill credits, follow these steps. 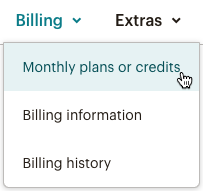 Click Billing in the Account navigation bar and choose Monthly plans or credits. In the Mandrill section, click Add More Emails For This Month. In the Purchase top-off transactional emails box, input the number of additional blocks you'd like to purchase, and click Add. Review your transaction in the sidebar at the top of the page, and click Complete Purchase. After you complete your purchase, we'll display a receipt of your transaction for your records. If you think you might regularly need more transactional email blocks, you can choose to automatically purchase additional top-off blocks when your credits fall below a threshold of your choice, so you always have enough credits in your account. To automatically purchase top-off credit blocks, follow these steps. In the Mandrill section, click Edit Recurring Monthly Plan. Click the first drop-down menu and choose the threshold for the minimum number of credits allowed in your account. Choose Automatically purchase the following number of transactional email blocks and use the drop-down menu to choose how many blocks to buy. You can choose to automatically purchase up to 100 additional credit blocks. You're all set! We'll automatically add your blocks to your Monthly Plan when you're running low. If you decide you no longer need to use Mandrill, you can remove it from your billing plan at any time. To remove Mandrill from your plan, follow these steps. Next to Mandrill, click Disable. In the Disable Mandrill pop-up modal, click Disable Mandrill.